William Geoghegan aged 36 yrs passed peacefully away from this troubled life on 18 Aug 1882. 1868–1869 On duty at Woolwich. 1869 Left Woolwich for Bengal. 29 Jan 1870 Assistant Surgeon 83rd (County of Dublin) Regiment of Foot. Apr 1873 Moved from 83rd Foot to Staff Bombay. 1874 On duty at Bombay. 1875 Left Bombay for Durham. 1875–1876 On duty at Birmingham. June 1879 To Cape from Northampton. 1880–1882 On duty at the Cape. 31 Mar 1880 Promoted Surgeon-Major. May 1882 To Dublin (Curragh). July 1882 To Malta from Dublin. 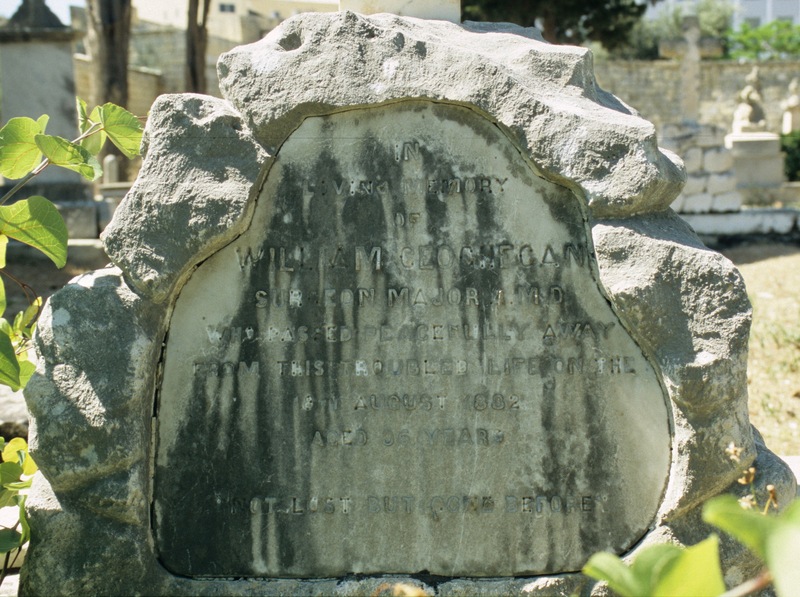 Malta 4 Aug 1882 Arrived from England in the hope that his health would benefit from the Mediterranean climate. His disease, however, progressed with extreme rapidity after he left England, and he died on 16 August from pulmonary tuberculosis. Malta 18 Aug 1882 Buried at Ta' Braxia Cemetery Pieta with military honours. Drew R., 1968. Entry No: 6411. Medical Officers in the British Army 1660 – 1960. Volume 1: 1660 – 1898. London: Wellcome Historical Medical Library. Malta. Brit Med J (1882), 2; 1130: 390 (Published 26 August 1882).